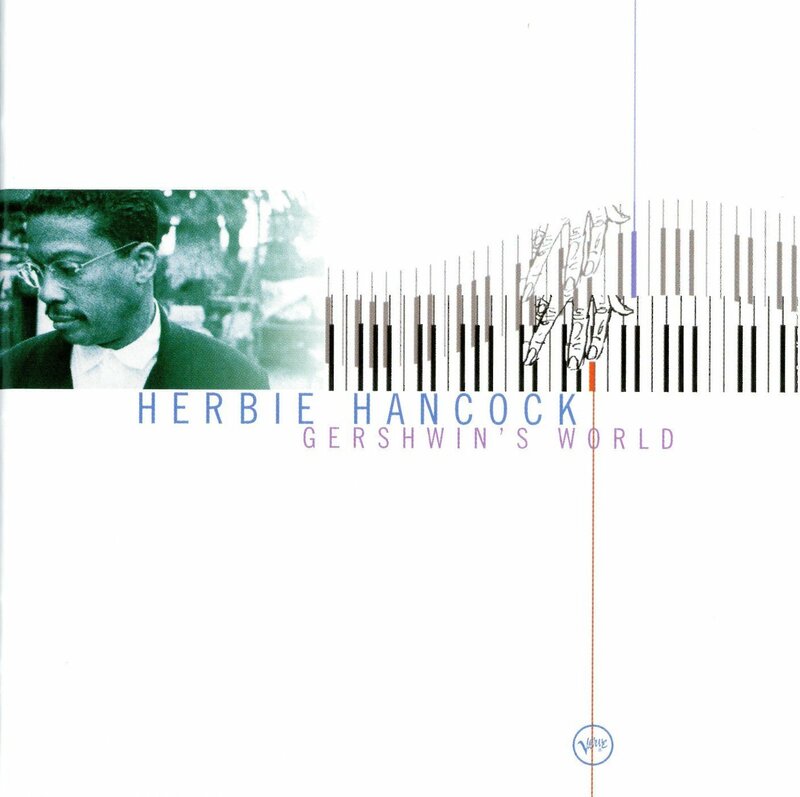 “Gershwin’s World is a tour de force for Herbie Hancock, transcending genre and label, and ranking among the finest recordings of his lengthy career. Released to coincide with the 100th anniversary of George Gershwin’s birth, this disc features jazzman Hancock with a classy collection of special guests. The most surprising of Hancock’s guest stars is Joni Mitchell, who delivers a gorgeously sensual vocal on “The Man I Love,” then provides an airy, worldly take on “Summertime.” On these two tracks, she shows she has come a long way from her folksinger beginnings to become a first-class jazz singer in her own right. A number of the young lions of jazz are featured on various cuts, and Herbie’s old pal Chick Corea joins the leader for a piano duet of James P. Johnson’s “Blueberry Rhyme.” Gershwin’s wonderful, extended “Lullaby” finds Hancock teamed with the Orpheus Chamber Orchestra, as does an attractive arrangement of a “Concerto for Piano and Orchestra” by Maurice Ravel, whose jazz influence can be heard on the piece. Herbie Hancock and I discussed this project for more than a year before we started recording. We both felt that to celebrate Gershwin on the occasion of his centennial, we wanted to honor his largeness of spirit, the musical and personal generosity which was characteristic of the man. Also, in searching to penetrate the spirit of his music, we wanted to create an album which had elements of jazz, classical music, African music, and some flavors which we couldn’t necessarily categorize at all. We included music of some of Gershwin’s closest fellow musicians. James P. Johnson, the master of Harlem stride piano; W. C. Handy, who brought the blues to worldwide awareness; Duke Ellington; and Maurice Ravel. These four giants each stand in a special relation to George Gershwin. Gershwin’s style is deeply rooted in the melodic blues idiom of Handy, and his great piano playing and writing are an extension of the style of James P. and his colleagues. Johnson played at the party after Rhapsody in Blue – shortly afterward, he composed his own great work for piano and orchestra, Yamekraw. When Ravel came to New York, he told his friends that he wanted to meet Gershwin, hear him play, and see one of his shows. He did all of that, and the first evening they spent together, Gershwin played piano for hours. Ravel was enchanted. Three years later, he wrote his last major work, the Piano Concerto in G – echoes of jazz float through this great composition. Gershwin had boundless admiration for Ravel, and even asked him for lessons – Ravel declined, saying that he would hate to risk stultifying Gershwin’s melodic gift. Ellington’s relationship to Gershwin is a little different. Born a year apart, the two men were kindred spirits in their search to expand the scope and language of American music. His “Cotton Tail” is based on the chords of Gershwin’s “I Got Rhythm”. Ellington was not alone in his affection for the chord changes of “I Got Rhythm” – they have been used as the basis for compositions by countless jazz greats, including Charlie Parker’s “Anthropology”, Thelonious Monk’s “Rhythm-a-Ning”, and Sonny Rollins’s “Oleo”. In his solo on “Cotton Tail” on this album, Herbie throws in a quick reference to the original melody. After Joni and Stevie collaborated on “Summertime”, Stevie stayed to do “St. Louis Blues”. He left the studio at 8:00 AM after working with us all night. Years ago, while on tour, Coleman Hawkins stayed up till morning jamming with the great tenor players of Kansas City and burned out the transmission in his new Cadillac pushing to make his next concert. Watching Stevie leave to catch a plane to Italy, I felt the warmth of that musical fire which cannot be bought or sold, but only freely given. “On this record we worked very hard to personalize the Gershwin material while staying true to the spirit of jazz. Anyone can play the straight Gershwin tunes. Our intentions were to reach inside to the core of each piece in search of the composer’s original impulses, and to take those elements and recompose and reconstruct them in our own way. This is arguably the most challenging project I’ve ever done. In recent years I’m more interested in working toward making events, not just records. This is the first example of the kind of record I’m interested in releasing at this point in my life. I wanted a structure that would encourage me to reach deep inside my sincerity, my heart, and my life for solutions. We never took anything for granted, never accepted any conventions. For example, we didn’t use drums on many tracks, but used percussion a great deal. I was also interested in rekindling my participation with classical music. Gershwin’s World won two Grammy Awards in 1998: ‘Best Jazz Instrumental Performance, Individual Or Group’, and ‘Best Instrumental Arrangement Accompanying Vocal(s) – St. Louis Blues’.